Stay in the heart of horse country at the Embassy Suites Lexington! Located about 1 hour from Churchill Downs, the Embassy Suites Lexington is a full-service hotel featuring the finest in Kentucky hospitality. Enjoy a fully guided horse farm tour with a visit to a bourbon distillery on Friday. On Derby Day 2020, our buses depart in the morning for Churchill Downs. Great tickets to the Kentucky Derby are included. Lexington is the perfect location to experience the Derby! This full-service hotel is the perfect fit for travelers seeking to experience horse farms and bourbon tastings prior to attending the Kentucky Derby! Featuring a full-service restaurant, indoor swimming pool, health club, business center, and WiFi. Each room is equipped with a mini-fridge, microwave, separate living room, 2 flat-screen TV's, a coffee maker. What's included in Embassy Suites 2020 Derby Packages? 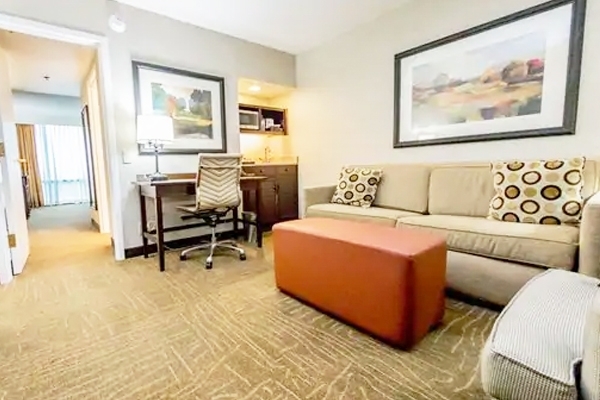 Stay at the Hampton Inn Downtown Louisville! Located close to 4th Street Live entertainment area and in the heart of downtown Louisville, Kentucky, the Hampton Inn is the perfect hotel close to Churchill Downs! Stay in the heart of Downtown Louisville! Stay close to Churchill Downs! Located close to the Fourth Street Live entertainment district, the Louisville Slugger factory, and the Jim Beam Stillhouse and Evan Williams Bourbon Experience. Hotel amenities include spacious rooms, free wifi, fitness center, indoor swimming pool, and complementary breakfast. What's included this Derby Weekend Hotel Package? Available for 2020 Derby Packages - Pre-Register Today! Sports Traveler is proud to announce our new Kentucky Derby packages at The Brown Hotel, Louisville's Landmark Hotel for the 2020 Kentucky Derby! Stay in this iconic hotel located in the heart of downtown Louisville, close to Churchill Downs. Since 1923, generations of Kentucky Derby attendees including elite and celebrity guests have stayed at The Brown. Now you can become part of history and stay at The Brown Hotel during the 2020 Kentucky Derby! Pre-register your interest now for Priority Reservations! Be a part of Derby history when you stay at The Brown Hotel during the 2020 Kentucky Derby! 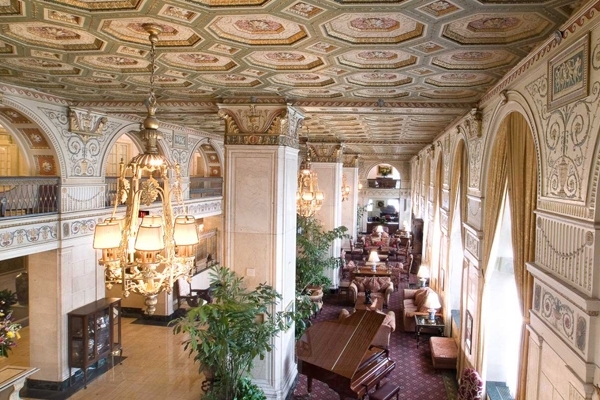 The Brown is considered the most iconic hotel destination in the city of Louisville! Sign up now for priority reservations for Kentucky Derby 2020 lodging packages at The Brown Hotel! Space will be extremely limited and this program will sell out. Luxury Derby Hotel in Louisville! Located in the heart of downtown Louisville, the Hyatt Regency Louisville is the perfect luxury hotel close to Churchill Downs for you to enjoy Derby Weekend in style! Beautifully appointed and newly renovated rooms, on-site fine dining options, and full-servie ammenities away you during the Kentucky Derby! 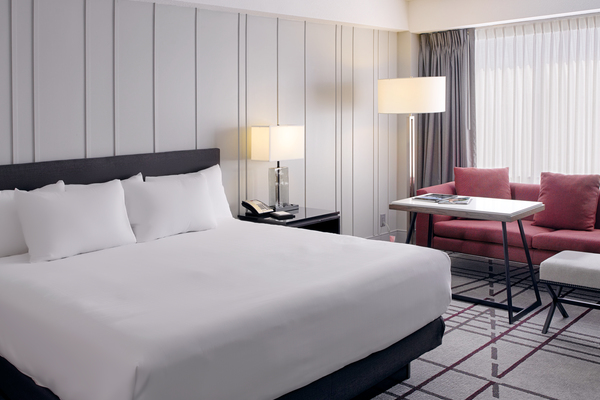 The Hyatt features rooms with city or river views, an indoor heated pool, 24-hour gym, outdoor tennis, an on-site upscale restaurant, and is connected to the pedestrian walkway providing easy access to Fourth Street Live! What's included in our Hyatt Derby Packages? - Optional access to on-site hospitality, local horse farms, & pre-Derby parties! Kentucky Oaks start time is 5:45pm ET. Kentucky Derby start time is 6:24pm ET. Churchill Downs gates open at 8:00am. The first post each day is at 10:30am. Plan your Kentucky Derby Experience to be the perfect combination of history and horse racing excitement during the famous Derby Weekend in Louisville, Kentucky. The date of the 2020 Kentucky Derby is May 2, 2020. Arriving in the beautiful state of Kentucky, guests will quickly notice the rolling hills of the Blue Grass Country and peaceful scenery of the many horse farms that line the city borders. Churchill Downs race track is located in Louisville, Kentucky in the heart of the Midwest of the United States of America. The city also sits on the banks of the scenic Ohio River. Walking into Churchill Downs is like walking back into the past. Cobblestone walkways line the exterior corridors. The architecture of the track transports you to a time gone past. Men dressed in suits wearing straw hats, and ladies wearing fine dresses and elaborate hats, complete the atmosphere of timeless charm. Even the official drink of the Derby, the Mint Julep, is a salute to a bygone era. The beautiful track features famous seating areas and multiple hospitality options to create the ultimate Kentucky Derby weekend trip. You might be wondering how much is a ticket to the Kentucky Derby. The most expensive tickets to the Derby are in the famed “Millionaire’s Row”, which is typically where celebrities come to watch the race. The best value tickets are in the First Floor grandstand sections, however you will not be able to see around the entire track from this vantage point. Higher sections providing better views include the 2nd Floor Grandstand and 3rd Floor Clubhouse. Several areas on the 3rd Floor have covered roofs that protect from the weather. The cheapest Derby tickets are in the general admission area called the Infield. This area is known for it's non-stop party atmosphere. There are no seats in the infield and there is no protection from the weather. Sports Traveler offers two lodging locations in our Kentucky Derby travel packages. Planning your Derby trip starts with deciding where to stay. Louisville offers lodging closest to Churchill Downs, but this convenience does come at a higher hotel rate cost. While visiting Louisville, travelers can visit the legendary Louisville Slugger Museum and the Frazier International History Museum where the life and ideals of Muhammad Ali can be explored. Staying in Lexington offers Derby travelers a cheaper hotel lodging price and the opportunity to explore the "Blue Grass Country" filled with equine history, bourbon distilleries, and horse farm tour opportunities. Let Sports Traveler plan your trip to the Kentucky Derby. 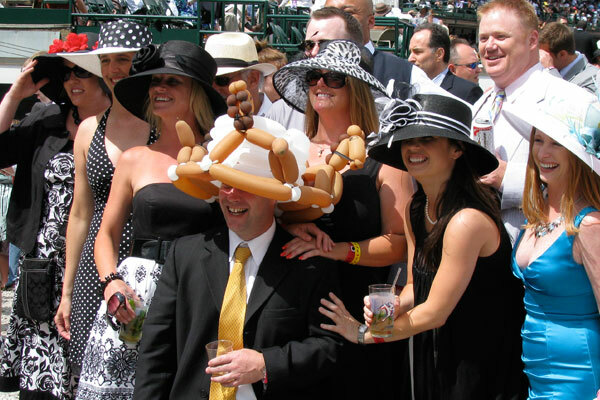 We specialize in Kentucky Derby Tickets, Travel Packages, Transportation, and VIP Derby Experiences for all budgets. Sign up today for information about the 2021 Kentucky Derby! It's not too early to start planning your trip to the 2020 Kentucky Derby. Sign up below and get notified when the packages and tickets to the 2020 Derby go on-sale! Join us in Louisville, Kentucky for the 2021 Kentucky Derby. We will be offering Derby hotel packages and 2021 Kentucky Derby ticket options starting a few weeks before the 2020 Kentucky Derby. We will once again be offering trip deposit and payment plan options on all Kentucky Derby Travel Packages. 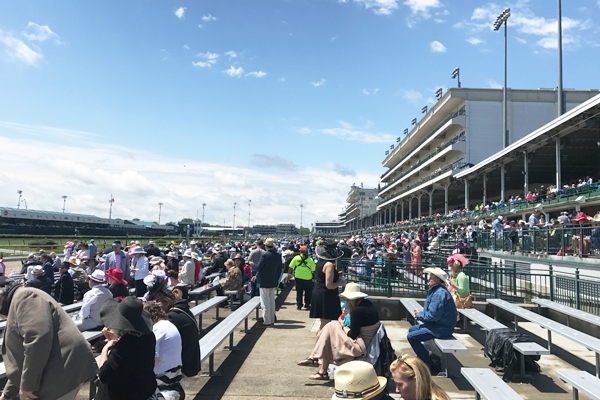 Our Derby package trips include hotel stay in Louisville or Lexington, plus your choice of Derby or Oaks tickets, transportation to and from Churchill Downs and optional area horse farm and bourbon tours. Please fill out the following form to receive information when our 2020 Kentucky Derby Travel Packages go on-sale. Packages will be available the week before the 2019 Derby. For immediate assistance, please call us at 1-888-654-7755.